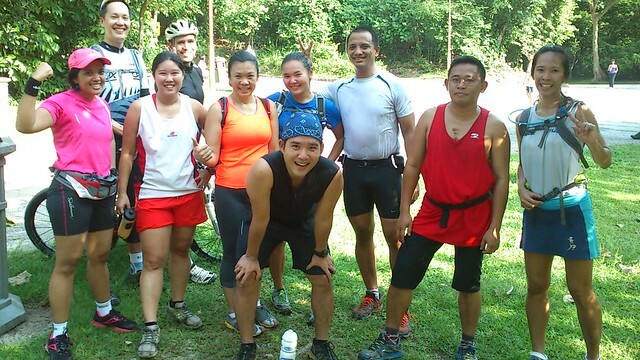 Venturing into Kiara trails for the first time. And boy, what a course! I was first introduced to trail running mid-last year by two close friends who go to a particular forest reserve to train on the hilly and jungle terrain. I have to admit running trail is hard but after a few sessions I have grown to enjoy it. Since then I try to incorporate a few offroad runs into my monthly mileage to not only to break the monotony of running on pavement and roads but also to enjoy a bit of peace and quiet in the wild and undisturbed nature. Running in undeveloped areas such as a jungle track lends itself to a magnitude of experiences, sights and sounds and each session always feels new. I can’t go as fast on a course like that because of the unevenness and technicality of the surface. So I always tend to enjoy the slower pace throughout but I don’t get lulled into this sense of relaxation for long. If hills abound I was going to get one heck of a workout! I’ve always been curious to try running Kiara trail because it’s a lot closer to where I live than my usual trail hangout. But because I did not know the route well I dare not try it on my own lest I endanger my own personal safety (this is true for any type of route, especially when it’s a bit more secluded). Hence when I found a group of regular runners who did the Kiara trail route I was happy when the leader of the pack, Tristupe, said I could join them. And so Malaysia’s 55th Merdeka Day was the day we agreed to meet and run. We met at 8:30 that Friday morning and I got to the agreed venue about 10 minutes late. I was a bit embarrassed about my tardiness especially since this is my first time meeting everyone. I didn’t even have time to warm up because as soon as I arrived and hastily introduced myself to the group of about 10 runners, we were ready to go! But just before that, the guys and girls stopped to chat with a fellow mountain biker who I swear looked a lot like the famous mountain trail runner Killian Jornet! After a few quick words with him, we walked quickly to the entrance of the trail and the run began…! The trail in Kiara is interesting since mountain bikers passionate about their sport first designed and carved the route out. Needless to say the track was narrow and no one could really run side by side with another runner because of this. Whenever a mountain biker was coming, a runner would always have to stop, pull over and let the biker pass through. I also learned that certain areas were given interesting names like Magic Carpet (because supposedly the trail descends in such a way that running fast down it elicits the feeling of being on a magic flying carpet) and Apollo (because the upward hill is supposedly at launch pad angle – if only I could ascend as fast as a rocket!). The runners who were seasoned to the route left me in the dust as I struggled to keep up to their pace. Running through the dense forest in great humidity and increasing elevation on a narrow lane really did pose some challenges for me, especially since the sun was rising higher by the minute and hungry mosquitoes were making a feast out of me. Add to that mix the feeling of disorientation because I did not know the route and the others who were hundreds of meters ahead of me. At times Tristupe would kindly wait for me at certain check points to help me catch up with the others, which I personally appreciated because I really had no idea where I was going. This is why I always prefer to run a new route with a group of runners, they are my trail of bread crumbs, so to speak. At one point I ran out of water on my Salomon fuel belt, so I siphoned some from Tristupe’s Camelbak, to which someone exclaimed, “Farah, that’s not a water bottle!”, obviously aghast at my tiny 200ml water bottle. 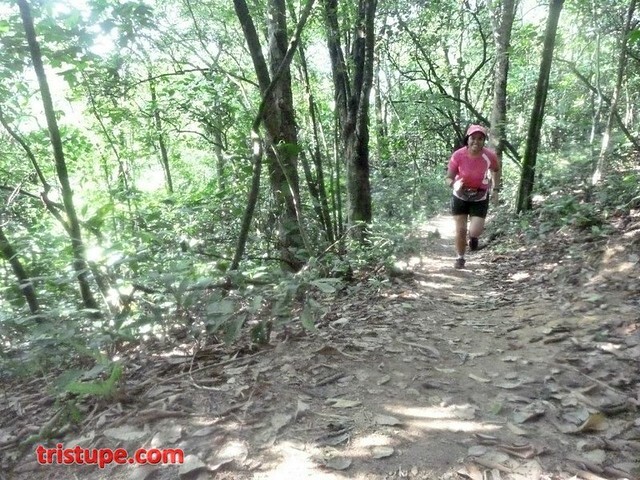 I have to agree, running on this kind of trail and in this crazy hot weather in Malaysia warrants you to carry as much water as your back can take! At this point everyone was averaging 2 litres on them! We spent about almost 2 hours covering the 9.3km distance (hampered only by yours truly), which included a section of the trail that was half-developed to become a private road but was later abandoned when nature lovers and concerned citizens protested the urban development of the Kiara trail area. Tristupe and friends took me to a lookout point where I could see the Kuala Lumpur skyline with the Petronas Twin Towers and KL Tower staring back at me amidst the ugly but not unusual haze. Lookout point at Kiara overseeing KL skyline. Going back down on tarmac road, my leg cramped up and I fell down, grazing my palm and cutting it. A guy nicknamed KL helped me get back up and Tristupe encouraged me to keep on moving to alleviate the pain. I did so and recovered eventually. I then encountered two Caucasian women riding horses; they smiled at me and we exchanged greetings. We then switched to trail again and finished the run that way. I passed by a rubber tree tapper, collecting white milky substance in a plastic bag. I asked Tristupe who they were tapping rubber for, and he said “for themselves.” I wonder what they made out of the raw rubber. It was close to 11a.m. when we finally ended the trail expedition and the sun was sky high. I was the second last person to exit the trail and I did so with arms held up high, and everyone gave me cheers and claps as I passed them to give them a high-5. This is what I love about the running community, you could be a stranger to them but when it comes to giving encouragement to you, you can count on them for that little boost of confidence and sense of accomplishment. So Kiara, will I come back to you for a friendly trail workout again? I sure will – only this time I’ll be sure to generously spray myself with mosquito repellent on all exposed areas of my body: I looked like I had contracted chicken pox when I finally got home and showered! Me (in pink) with my new set of happy trail running friends.